There are a few people you hear about in the news everyday. Doctors who have created some miracle cure or perfected an important medical procedure, CEO's who have made multi-million dollar deals and politicians proposing new laws. For every high profile worker you do hear about however, there are a million more that go unnoticed day after day, even though theirs is the work that we all depend on the most on a day to day basis. That is why Kronos, the leader in workforce management solutions, has created the "1 in one hundred million campaign" to recognize American workers in a variety of fields that do the work that matters most, but more often than not go unnoticed. 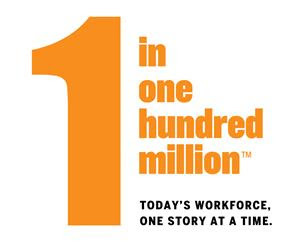 Dedicated to recognizing those who go unnoticed and deserve it most, the Kronos 1 in One Hundred Million campaign has created a site 1in100million.com that is dedicated to recognizing incredible individuals in a variety of workforce fields nationwide. Each month they create a video featuring an inspiring worker who represents the character, committment and passion of today's workforce. You can visit the site to watch videos about these incredible ordinary workers. My personal favorite video is about Vanessa Barrett the trauma nurse. All too often the nurses are the ones whose work goes unnoticed, as the doctors take center stage. It is incredible the amount of effort and compassion they pour into their work. Growing up, I saw this first hand with my mom. She was not a trauma nurse, but instead was a nurse in nursing homes and later in Hospice care. I saw how much passion and drive she put into her work everyday and how tired she was when she came home. I also saw how little she was thanked and really recognized for all that she did. You can check out Vanessa Barrett's video below. May's video features Major William Saint who is commander of the 62nd Weapons of Mass Destruction Civil Support Team CST (Civil Support Team) for the Louisiana National Guard. His team focuses on Weapons of Mass Destruction and he commands a team of 22 all while maintains is role as a husband and father of four young children. You can see his story and this month's video below. His story is especially inspirational as Memorial Day draws near. These videos are a great reminder of what goes on behind the scenes of every company her in the United States and how much each individual worker matters. From the produce manager in a grocery store to a Major in the Army, this country wouldn't be what it is without each person doing their job. Want to help celebrate the everyday American worker? You can subscribe to the 1 in One Hundred Million video series at 1in100million.com and get instant notifications when a new video goes live each month. Don't forget to share the videos on social media to help spread the news about these incredible #WorkforceStories.